The unique and exceptional Clef du Vin™ is essentially a measuring instrument that will immediately tell you if your wines are suitable for laying down, and thus revealing their ageing potential. In a controlled way, it will gradually modify the organoleptic qualities of the wine (taste, smell, flavours and bouquet). 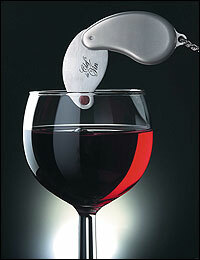 The Clef du Vin has been carefully calibrated so that one second of contact in a glass of 10 cl. (or a bottle of 75 cl. using the corresponding key) will display the potential lay down time of one year. Effective on all types of wine (red, rosé, white, dry, mellow, sweet, fortified or sparkling), the Clef du Vin is in fact an informative measuring instrument. Designed by a French winemaker, the Clef du Vin is a revolutionary new tool to help you assess the ageing potential of your wine. Immersing the Clef in a sample of wine for just one second simulates the effect of 1 year’s ageing, 2 seconds for 2 years and so on. So now you can judge whether a wine is worth laying down and, if it is, when it is likely to reach its peak. It also makes young wines drink better now – plus it’s fun to use and try on any wine. The Clef is totally inert. It does not contaminate the wine in any way. It is simply a catalyst to promote the normal ageing process that takes place naturally. Has wooden decoration on the handle. Comes in a mock leather box with full instructions. Works in the same way as the Pocket model but is intended for use at the dinner table. Has wooden decoration on the handle. Comes in a mock leather box with full instructions.